A Uniquely Designed, Misting Water Feature With Styling Inspired By Mother Nature. A dark rock mountain emerges from a misting pool that looks like it was carved from a fallen tree. Once you plug it in, this hollowed out stump becomes a world unto itself thanks to the myriad of features that make it much more than a regular fountain. With a mist generator, water pump and rolling ball system in one, this model is sure to enhance any space. Water cascades from beneath the gently spinning orb, and then trickles down the rock face to fill the cave where the mist maker sits. The glass ball will slowly spin as the water flows, and a light underneath enhances the look. 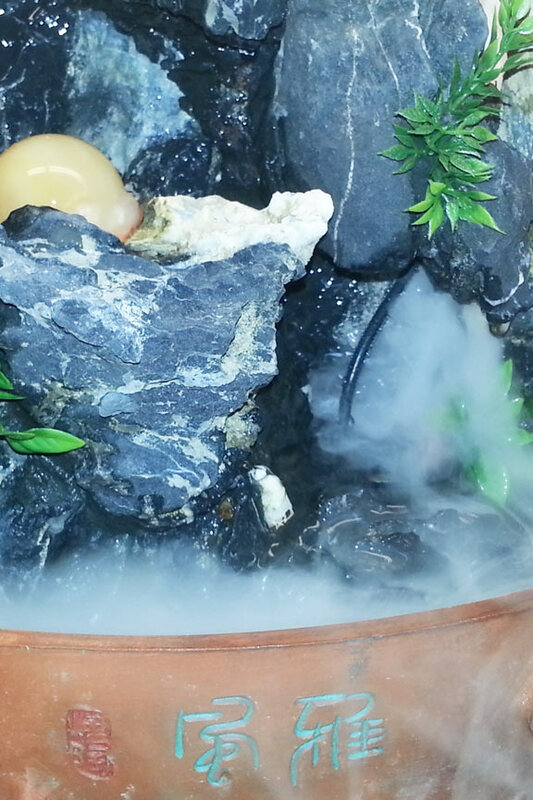 Once the misting chamber fills enough to submerge the device, a mysterious cloud will begin to form, and billow out. The mist flows with the water and then floats on top to fill the bowl. The contrasting look of wood and stone work well together, and although the materials look incredibly natural, they are actually crafted from a durable resin. This construction technique allows for incredible detail, but it also gives the piece a substantial weight that adds to the authenticity. Additional foliage appears to grow randomly from the cracks and crevices, and the whole thing looks like it was plucked right from the forest. The continuous cycle of running water generates calming background noise that will soothe your mind, body and spirit, and leave you calm and rejuvenated. High Quality. Hand finished, and crafted from superior resins, this product has an authentic look, and long lasting durability. Top of the line electronics ensure proper function and a long life. Multiple Features. Not just a mister, and not just a regular fountain. A powerful mist generator combines with running water created by the pump to create a powerful scene. The addition of a rolling glass ball that is lit from the bottom further enhances the look. Natural. Made to look like natural stone and wood, this fountain looks like it was pulled right from nature. With more than just visual appeal, it allows you to add moisture to the air, or make the room smell nice without any chemicals or fancy contraptions necessary. Beneficial. It will certainly improve the look of any room you place it in, but there are added health and environmental benefits too. The mist is great for plants, people with allergies, anyone with asthma and more. Increase humidity and clean the air at the same time. 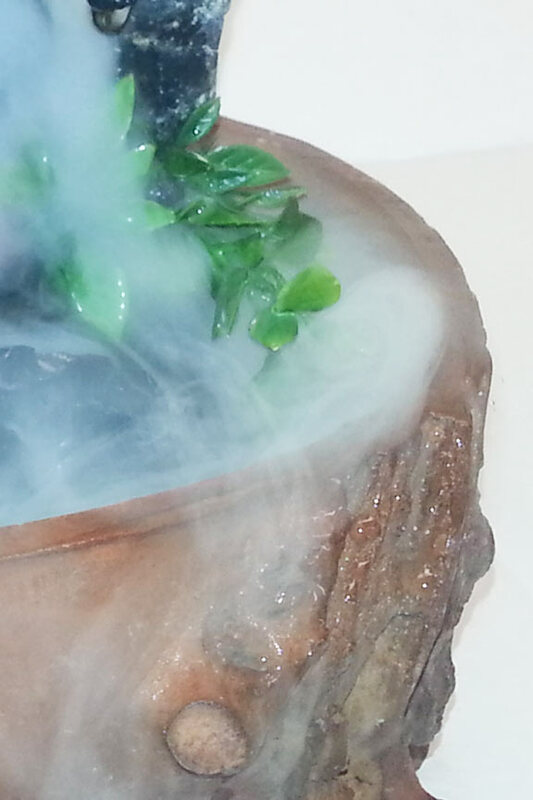 It looks like there is a lump of dry ice in the bowl, or some chemical fueled fog generator, but there isn't. All of the visual effects are naturally created, and the thick fog is nothing more than water vapor. The water pump will help to fuel the mist maker, but nothing more than tap water is necessary to make it work. Once turned on the hidden pump will bring water up. It is released at the highest peak, and also under the ball. The force will cause the ball to spin, and the escaping water will flow to the cave where the mister is stationed. 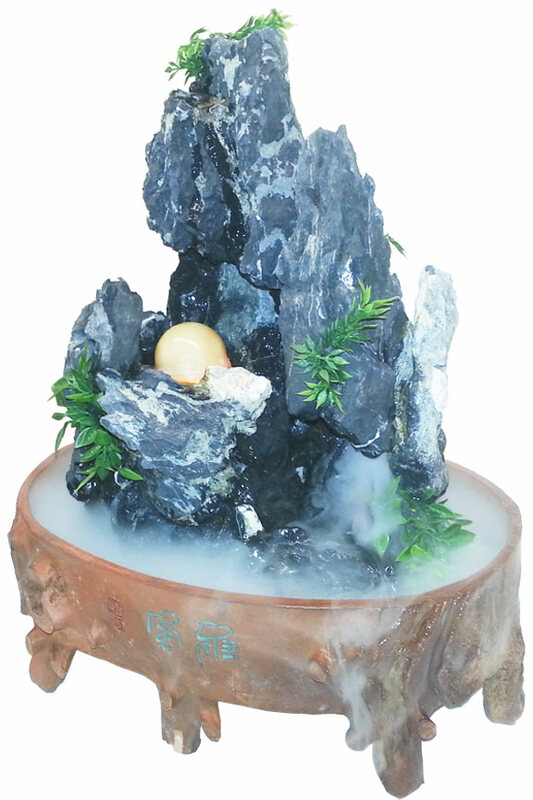 Once submerged, the mist maker will begin to evaporate water to create a natural cloud that will flow with the water, and fill up the bowl. It acts as a cool mist humidifier, but you can also add essential oils to the water to add fragrance at the same time. As a byproduct of the mist production, negative ions are generated. They cling to dirt and pollen in the air to neutralize them and leave it cleaner. 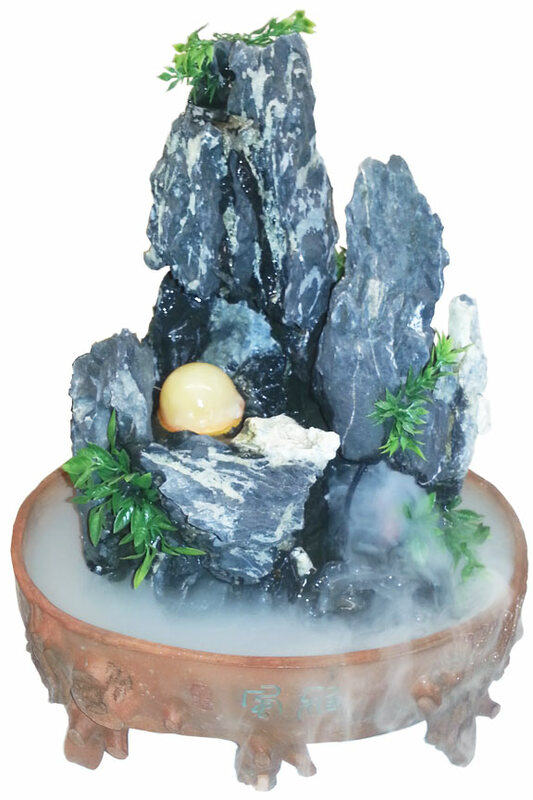 Dimensions 8.5" x 11.5" x 15"
A naturally styled fountain with intricate detail. Relaxing water sounds will combine with soothing visual effects to improve any space. With added benefits of humidity and air purification, it's perfect for any room. Order Yours Today! Received my fountain about a week ago. Very attractive piece to go with furniture. BUT 1. It uses very much water. 2. The mist is quite heavy so you need a lot of area because of dampness. 3. Heavy to handle. 4. Instructions are very hard to follow in English. Is the ceramic disc replaceable? Do you sell it? Will I be able to put new one in? Yes. Yes. And yes. The disc is totally replaceable, and new ones come with the special tool required. Anyone can do it in a matter of seconds.